Visual Studio Application Insights – Application Availability and up-time monitoring for free! 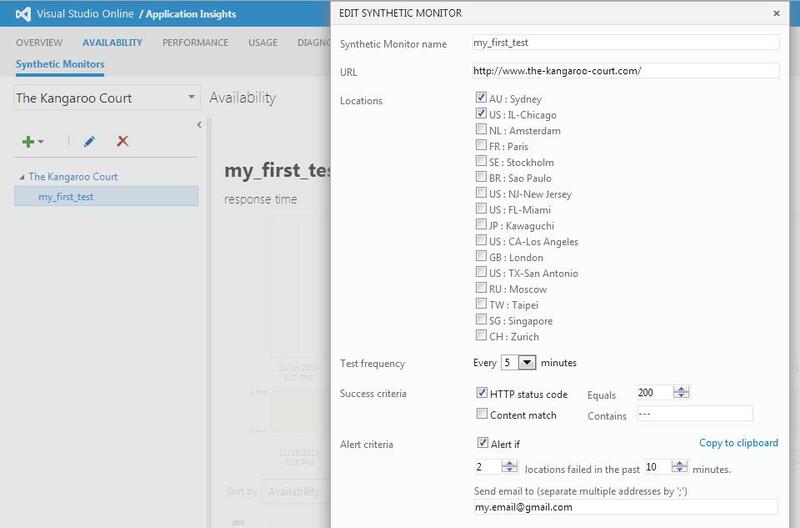 I know there are already apps out there that perform application uptime monitoring (and I’ve had to build one or two myself in the past), but now Microsoft have released (in preview) a way to monitor your on-premise and cloud applications using Visual Studio Online – Application Insights. Best of all, it’s free! From what I can tell thus far, it allows one to monitor not only server metrics such as CPU, network utilization etc, but also perform uptime tests, by either pinging application urls (as defined by you), or running Visual Studio web tests which you’ve already written and exported to file. After reading about application insights today on Brian Harry’s blog, I thought why not try implementing it on The Kangaroo Court? FYI – The Kangaroo Court is a site hosted on Windows Azure, using a web role as part of a cloud service, so I won’t be covering the steps you’d go through for an on-premise application. Update your serviceconfiguration files. Note that the wizard only said I needed to update my serviceconfiguration.cloud.csdef file, however, I had to update both the cloud and local files. If you watch the video provided, it shows the user updating both anyhow, so no problem there. Note also that if you already have a ConfigurationSettings or Startup section defined in your file, you’ll simply need to update the sections with the new configuration variables and startup task from the code provided by the wizard, rather than copying over the entire ConfigurationSettings and Startup sections. I initially did this, and as expected, Visual Studio told me things were broken! Go to the Application Insights page on the Visual Studio website. My url looked like this: https://my-username.visualstudio.com/_appanalytics/_overviews/dashboards. The next step was to setup some uptime monitoring, so I could make sure The Kangaroo Court website was up & running, and that if it wasn’t, I would know about it. As an aside – In my view this is an often-overlooked and yet essential feature for any website, as most developers I know (and certainly business stakeholders) would rather know that their site was down BEFORE any customers did, rather than finding out later on that their site was down for hours before they knew about it, and they’ve lost business because of it… This is particularly true for sites where the only way a customer can inform you of any errors is via a Contact Us page, which is pretty useless if the site isn’t available for users in the first place. If 2 locations failed within a ten minute window, I will be sent an email notifying me that the site is down, so that I can then take appropriate action. Awesome!!!! Well that’s all I’ve done thus far, but as you can see, Application Insights provides some pretty cool features out of the box, and I haven’t even dug too deep into it yet. I’ll continue to explore and hopefully post more soon. Till then – enjoy!